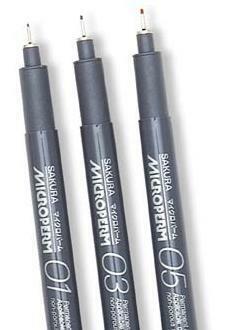 Microperm pens are idea as a film marking pen. They produce precise lines of 0.3 mm in width. It is perfect for marking microscope slides, photographic slides, Mylar, etc. Writes on all surfaces including glass, film, plastic, metal, porcelain and all smooth surfaces. The permanent ink dries within a second and is water-proof and fade-proof. They are available in four colors: Black, Blue, Green, and Red. Microperm pens are sold individually, in six packs, or an assortment pack of twelve pens (6 Black, 2 Red, 2 Blue, and 2 Green).